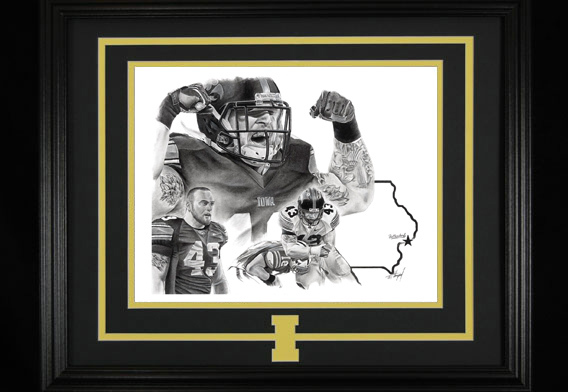 Growing up on a farm in central Iowa, Sean enjoyed drawing as a hobby as well as watching the Iowa Hawkeyes play football. 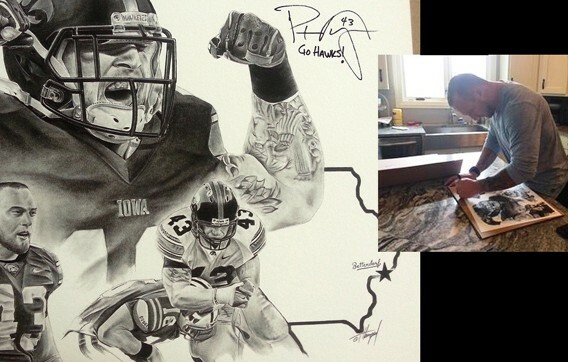 After living in different areas of the country, Sean returned to central Iowa and began to take his artwork more seriously. 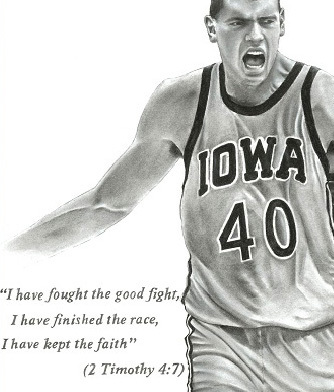 His passion for the Hawkeyes never faded. 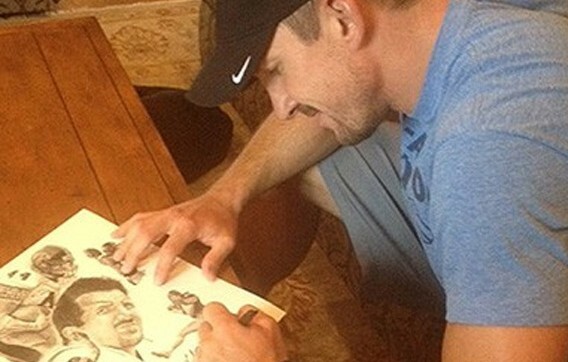 Frustrated by the fact he couldn’t find art prints of his beloved team, he decided to take matters into his own hands…literally. With influences such as J.D. 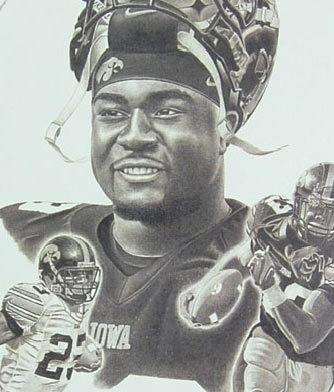 Hillberry and Georgia O’Keefe, Sean began to use charcoal to portray images of some of his favorite Hawkeye stars. 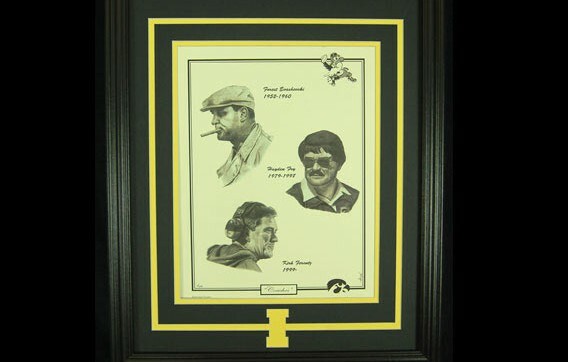 After receiving approvals from such notables as Hayden Fry, Kirk Ferentz, Chuck Long, and others, Sean became a licensed artist with the University of Iowa and his work has since appeared in art shows, galleries, and charity events around Iowa. 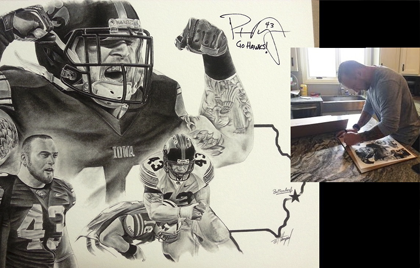 Sean’s work can be seen at the Des Moines Farmers Market in the summer as well as select Scheels locations. 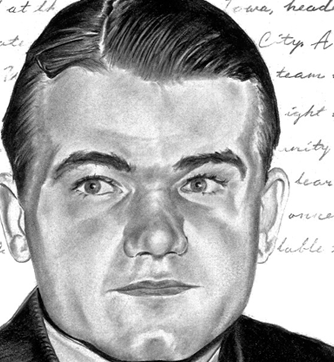 The story behind this piece is a long one and if you choose can be read in my own words in this Gazette Story. 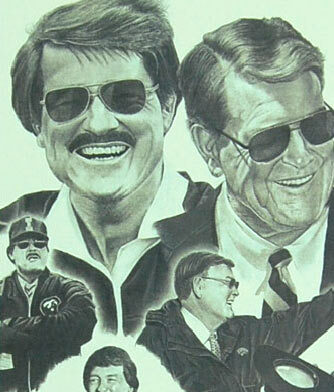 It's nearly impossible to convey what this drawing means to me in a short paragraph. It was a turning point in my artwork and the purpose behind the piece is very near to my heart. I had always wanted was to try to create a drawing that fooled people into thinking it was a photo and I wanted to also somehow 'give back' something that would help others with my art. 'Faith' allowed me to do both of those things. I feel it's my first work where I felt comfortable calling 'art'. I can’t speak for everyone, but I feel people can look at this piece and see so much more. I think it was my first piece that is thought provoking and inspires emotion. 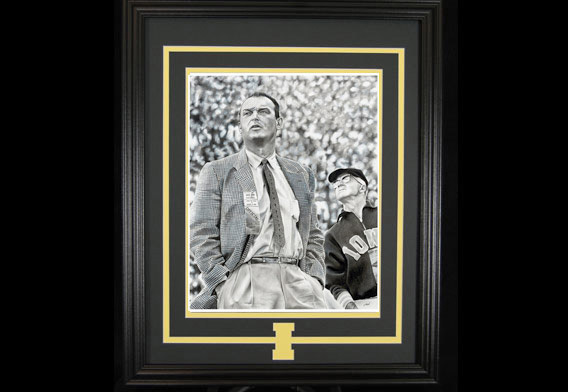 The pose, that game, the absolute separation of Rob Houghtlin and 60,000-plus screaming fans in his moment of concentration and personal relationship with his beliefs. I loved this drawing from the moment I started it and the entire creation and purpose behind it was very emotional for me. 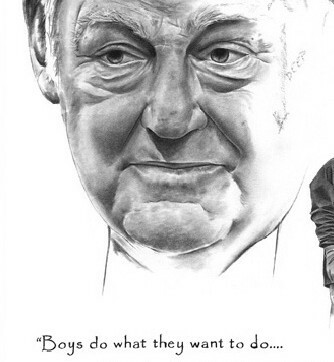 I believe that is somehow conveyed in the drawing and people see that without even realizing it. 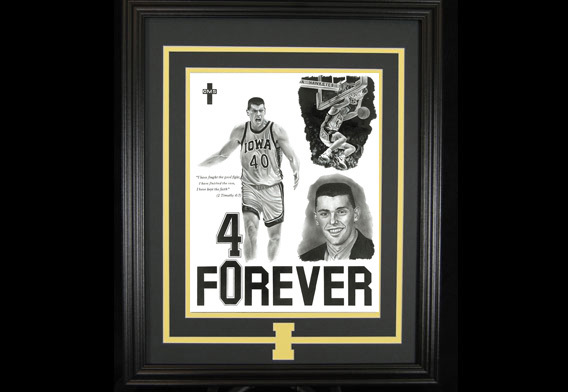 I am so proud to say that the sale of the original and subsequent dinner, with the help of Rob Houghtlin himself, raised $8,500.00 for the family of former Hawkeye Brett Greenwood. 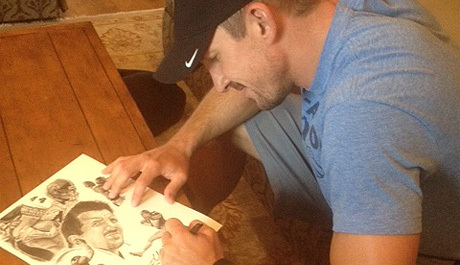 I was beginning receive a lot of feedback related to the detail I put into my drawings. I felt that if I was more patient, the drawings would turn out better. This was also one of the few pieces where I intentionally kept track of the amount of time involved, and it was roughly 92 hours. 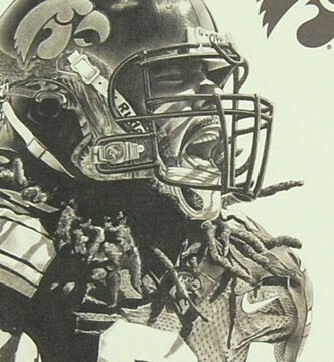 Keeping with my intention of trying to capture images in reflections, I tried to capture Herky standing on the field in the lower left corner of Adrian’s helmet. 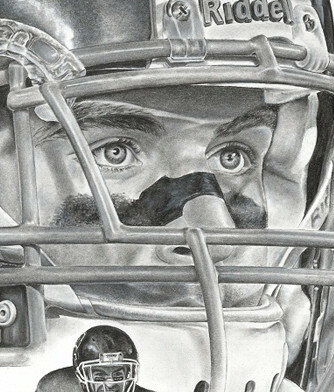 I think my patience paid off as I worked extensively on every detail, even trying to capture helmet scratches shining in the sunlight. 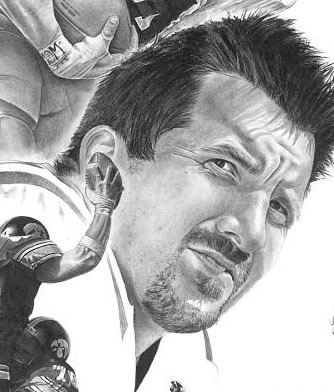 Dallas Clark and Tim Dwight have consistently been two of the top requests that I have received since I began. Finally got around to getting the “Dallas” done. 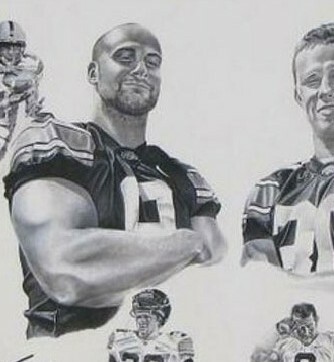 Tim Dwight next? 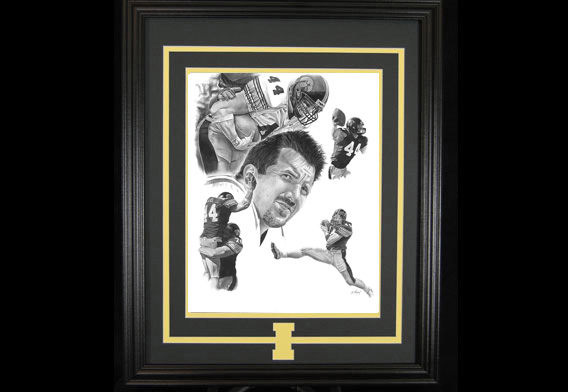 Part of the proceeds from this piece will also help support the Dallas Clark Foundation. 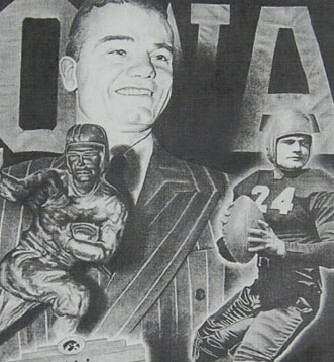 Iowa City native, All-American, Lou Groza award winner, University of Iowa Football’s all time leading scorer. I couldn’t think of a better former Hawkeye to portray in one of my pieces. 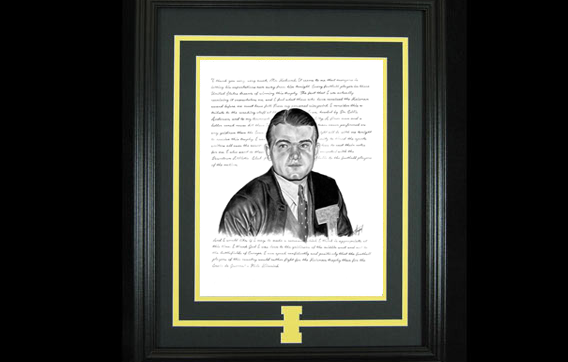 I first met Nate through my initial involvement with fundraising as he is closely involved with raising money for the University of Iowa’s Childrens Hospital. 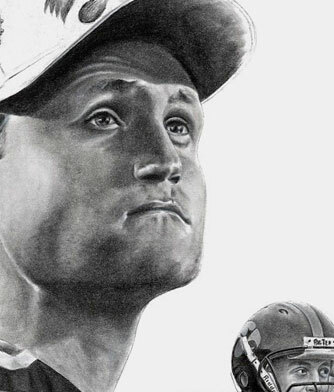 Each spring when I would see him at the Childrens Hospital Open (an event initially spearheaded by Kaeding), it reminded me that I am long overdue in attempting a “Nate Kaeding” piece. This was my very first piece. 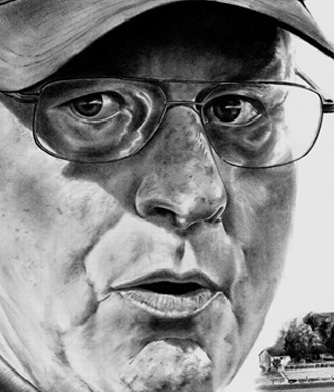 I hadn't picked up a pencil or piece of charcoal in years. 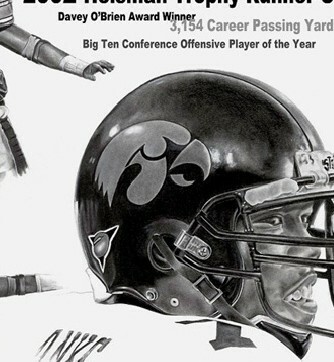 I'd seen renderings of sports figures at malls over the years and always tried to find one that was Hawkeye related. 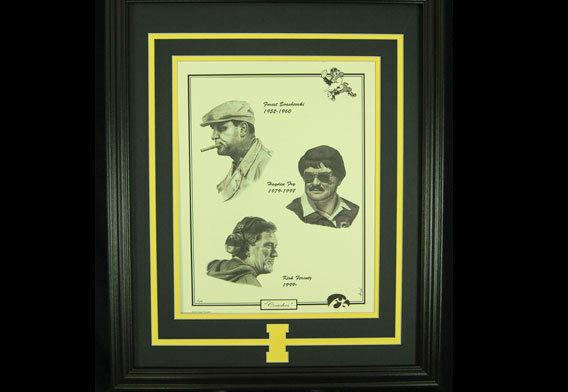 I often thought 'If I ever created some artwork relating to the Hawkeyes, I would love to see one of some of the prominent coaches in Iowa football history'. So I sat down and started working, never thinking that my artwork would be noticed or just how popular it would become. 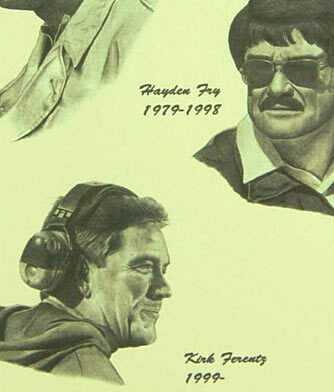 I was simply drawing these three coaches to see what it might look like if my vision were put to paper. 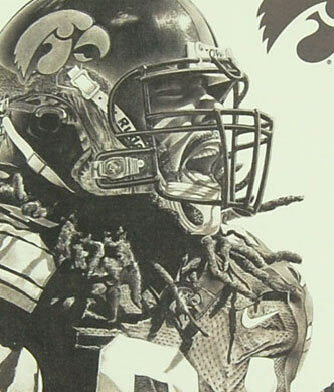 I absolutely loved the 2008 season mainly for one reason; Shonn Greene. He ran over and lifted would be tacklers straight off their feet. He was so much fun to watch and his story of determination was very inspiring as well. 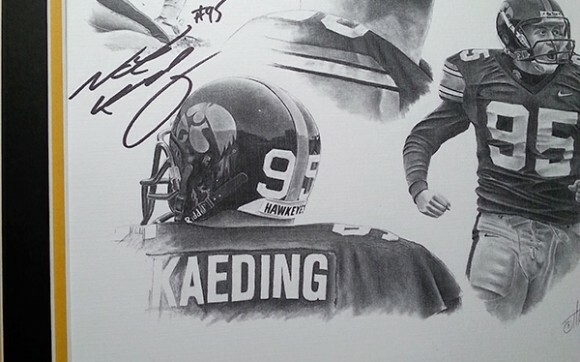 This was going to be my first 'feature' piece of a semi-current player. Somewhere about three-quarters of the way into this drawing, something happened that changed what I would do with future pieces. I discovered while working on Shonn’s helmet in the lower right image, I could place whatever I wanted in the reflection. 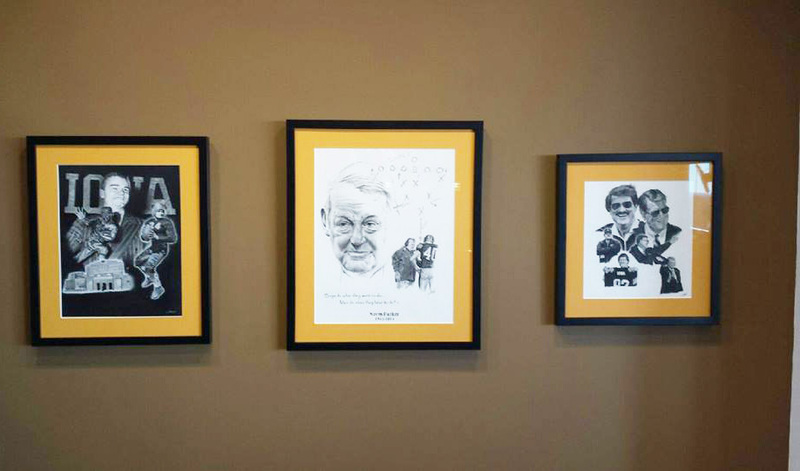 I opted for trying to capture the pressbox at Kinnick to kind of personalize where he may have been during that run; I loved it. I’m going to try to capture something in reflections that customers can look for in my work, although I still have to point it out to a lot of people. 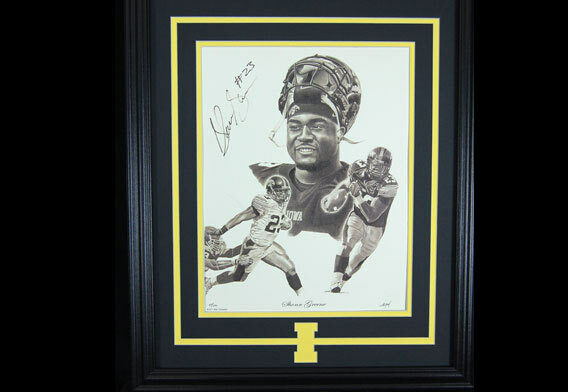 This was also the beginning of my involvement in fundraising as I was happy to donate the signed original to the University of Iowa Children’s Hospital charity golf tournament. 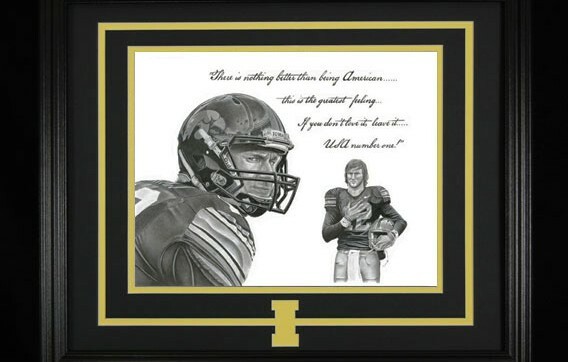 This is without a doubt one of my personal favorites. 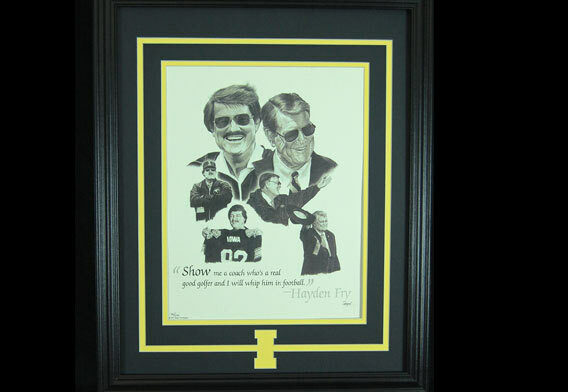 I started to hear from customers that one of the reasons they loved my 'Coaches' piece was because it featured Hayden Fry. 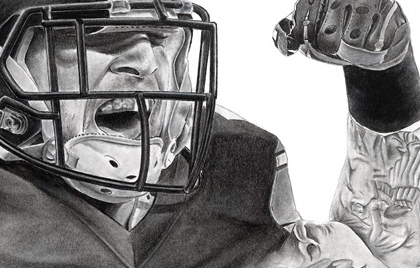 I knew it was time to start drawing one of my favorite sports figures of all time. 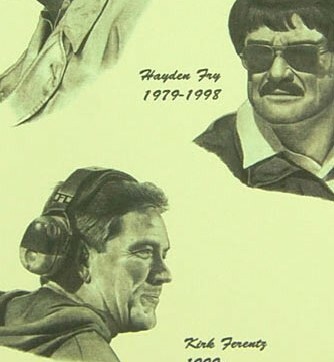 I knew I had to capture at least one shot of Hayden in the glasses, full mustache and Iowa cap; that’s how I always remembered him when I was young. I really went out of my way to tell a story and timeline through the images. 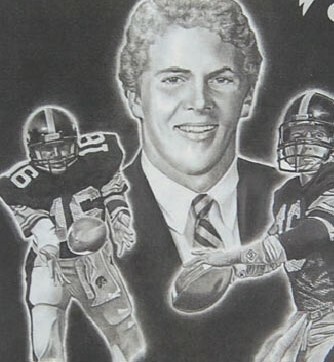 From 1979 when he first arrived in Iowa City to his 1998 retirement and the 2010 Rose Bowl when he was inducted into the Rose Bowl Hall of Fame. I had a really tough time narrowing down to three Hayden images that I wanted to use but finally settled on three of my favorites. After experiencing some success with my “Coaches” piece, I began to get requests from merchants who had carried my work, as their customers were providing suggestions and feedback. The first and most often requested item was Herky. 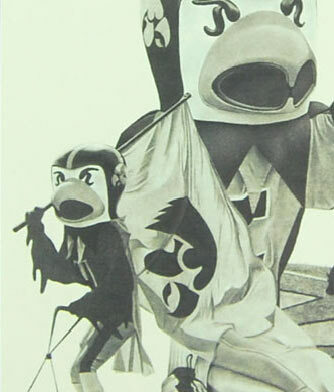 I wanted to try to capture Herky in two or three poses. This is definitely one of my more popular pieces. When people look over work but just can’t decide on which piece to purchase, nine times out of ten they will walk away with a “Herky”. 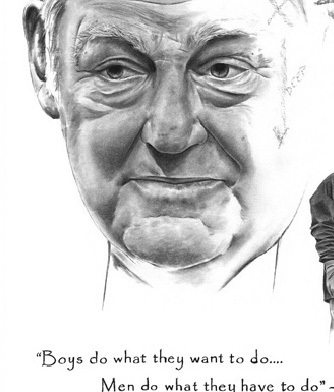 As with my 'Coaches' piece, this was something I had envisioned in my head for some time. 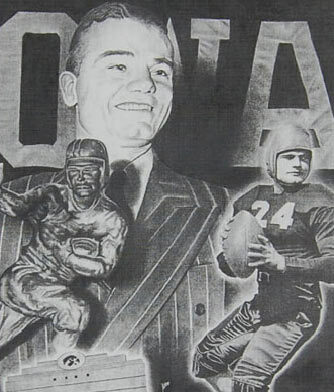 'Ironman' Nile Kinnick in an action pose, accepting the Heisman Trophy and a shot of the stadium that carries his name. 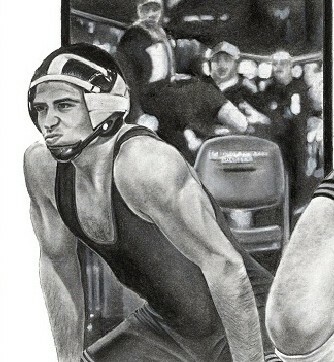 This was my first full charcoal picture, meaning that the entire page is filled with charcoal. This piece was very time consuming, but I also found myself extensively researching each subject as I perused old photos to work from. 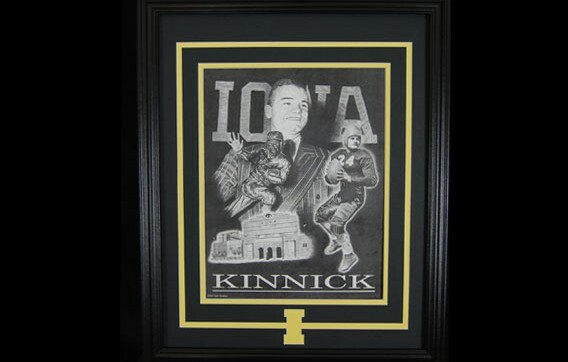 I learned much more about Nile Kinnick during this time and was astounded at what he had accomplished at such a young age. 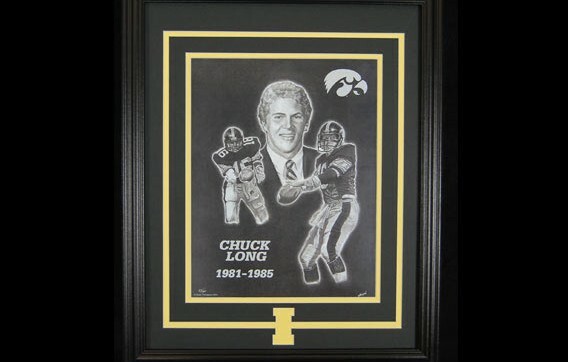 Chuck Long is still one of my all time favorite Hawkeye players. 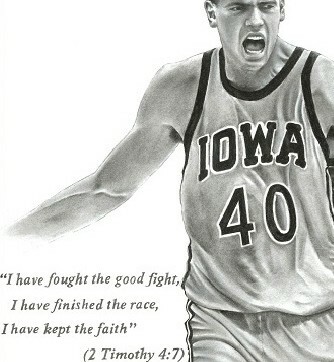 I have fond memories from his days as a Hawkeye from my high school years. 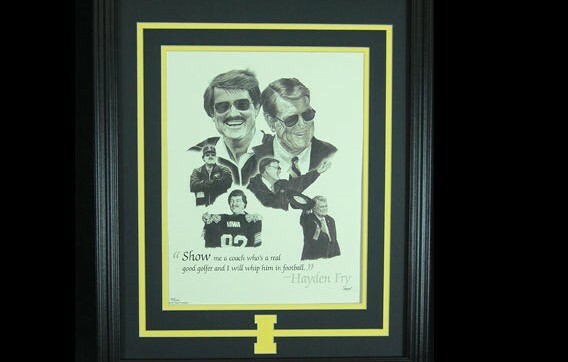 When I started doing this, there were two Hawkeye related figures I knew I wanted to draw; Hayden Fry and Chuck Long. One of my first real exciting moments related to my Hawkeye Art series came when I was walking down the street and I looked at my phone to see a new email. 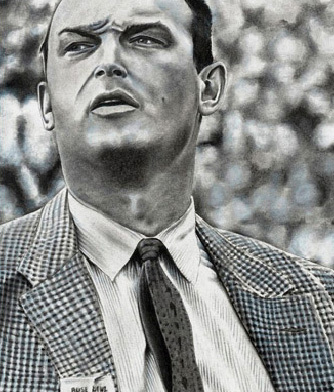 It came from a Charles Long. 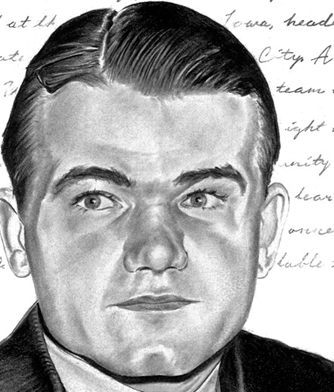 I thought, 'Who the heck is Charles Long?' 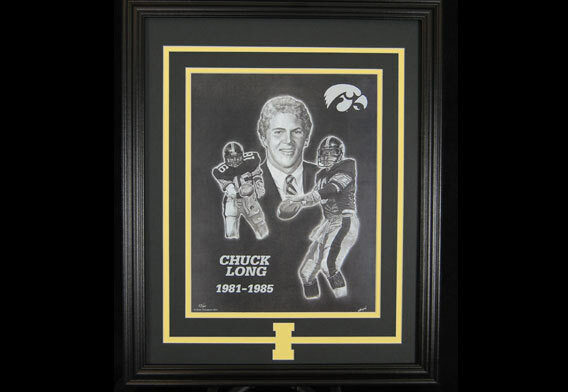 But when I read the email, I realized it was from Chuck Long. He told me he had seen the finished piece and he really liked it and gave me his blessing to market it. 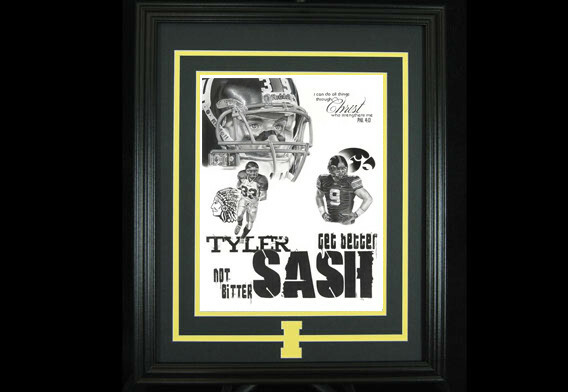 With the wonderful NFL success that Tyler Sash was enjoying, I was becoming flooded with requests to capture him in one of my drawings. Due to working with Tyler on my 'Faith' fundraiser, I knew he was not only a close friend and teammates with Brett Greenwood but he also was very active in raising money for those in need. 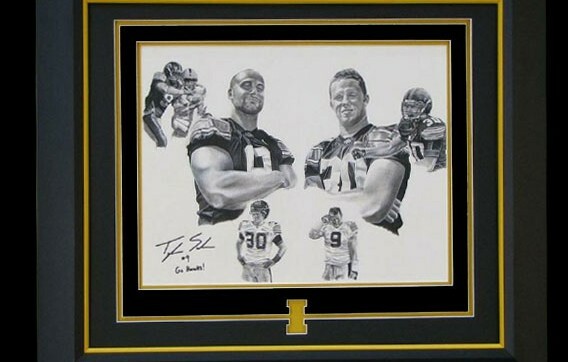 While coming across some photos of these two together in an old Hawkeye photo shoot, the idea came to me of drawing them together and using this piece in another fundraising effort for the newly formed 'Brett Greenwood Foundation'. Tyler was all for it from the beginning. It was an honor to meet Tyler at his old elementary school in Oskaloosa and present him with the first view of this piece in front of 1,100 grade school children. I have special places in my heart for each one of my drawings, but I wouldn't be totally honest if I didn't say this is one of my favorites. 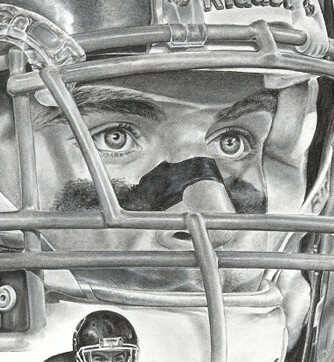 I decided to push the limits of detail in this drawing. I tried to summon extreme patience but could not help but rush a little as I was becoming excited at what was appearing on the paper. Although this was definitely my most time consuming piece yet (over 100 hours), I finished it in only a couple of weeks because I just couldn’t stop working on it. Staying up until 3 or 4 am was becoming the norm when working on 'Stanzi'. 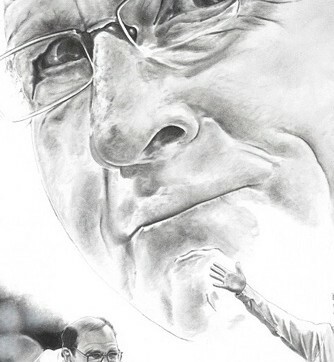 The little things that most people may not see are sometimes my favorite in a piece like this. 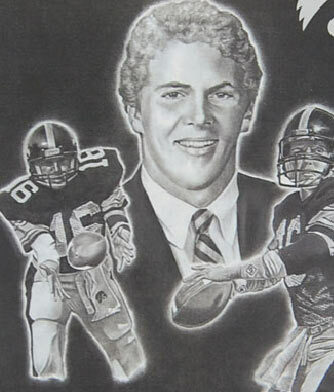 The light pole behind the stands of Kinnick in his helmet that appears to illuminate, the stitching in Rick’s jersey or the veins in his hand. I believe that it may be these “little things” that people may not look at directly but when viewed over time it makes them ask 'That is a drawing?' 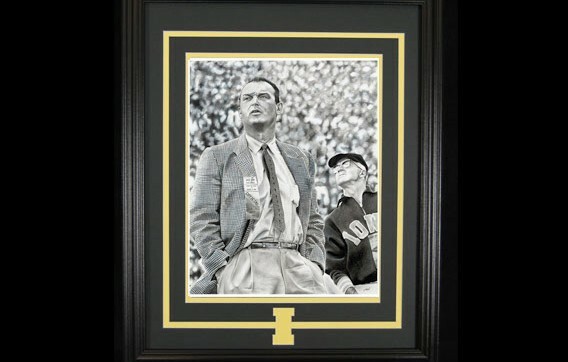 This piece is also a culmination of suggestions from friends and fellow fans. While casually talking with them, they would mention things like “If you do a Stanzi, you have to capture the flyover,” or “You have to catch that shot of him during the National Anthem”. 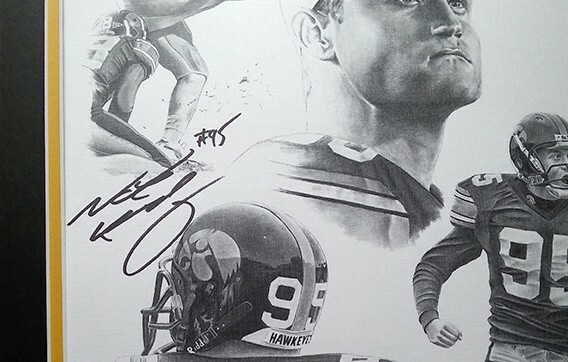 It’s the connections with fans which makes this so much fun because as I always tell everyone, I’m just a Hawkeye fan first, the art is the icing on the cake. Iowans love wrestling and Iowans love Dan Gable. 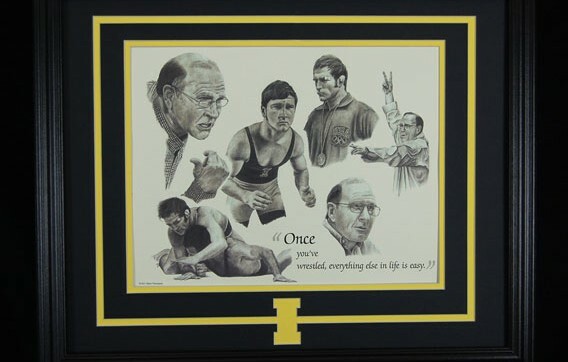 I had received several requests for either a wrestling piece or Dan Gable specifically, so I knew it was time. 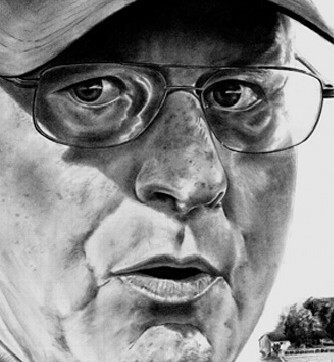 This was another piece where I spent several hours researching the subject before beginning my work. 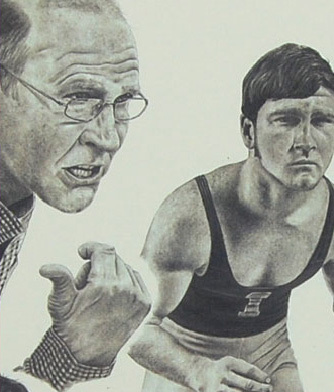 It was through this research that I realized just how amazing Dan Gable was and how compelling his story was. I am primarily a football fan but by the time I finished this piece I had become a huge Dan Gable fan. I have been planning this Street piece for nearly a year & finally made the time to do it. 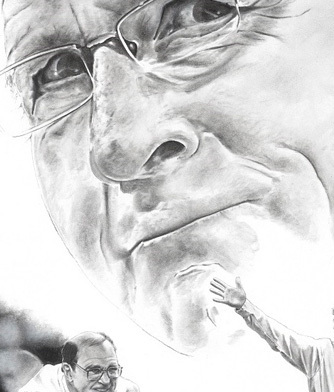 The main goal of this drawing is not only to commemorate 20 yrs since Chris’s passing but to celebrate his life and renew awareness of the Chris Street Foundation. 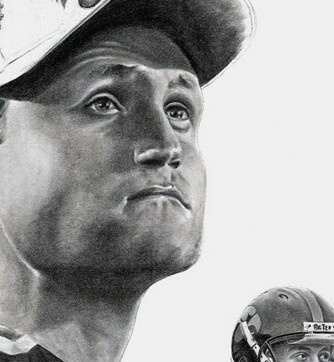 A portion of all proceeds raised by these prints will go to the foundation and it is hoped to raise more money in auctioning a select few specially numbered prints. A special thanks to the entire Street family for their input and gracious assistance with this piece. 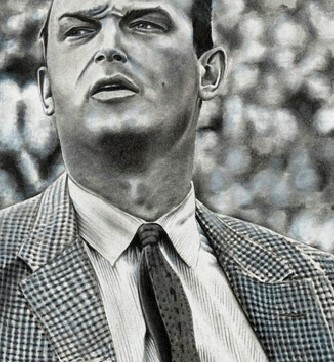 Feeling the need to return to a full size photo-realistic piece similar to “Faith”, I began work on “Evy”. I loved the image from the first time I saw it and it had been sitting on the back burner for some time. Once I got started on the checkered jacket, however, I discovered that this piece was indeed going to be “work”. The work that was entailed in the jacket & dress shirt that I hadn’t previously considered, resulted in a two month long project for completion. 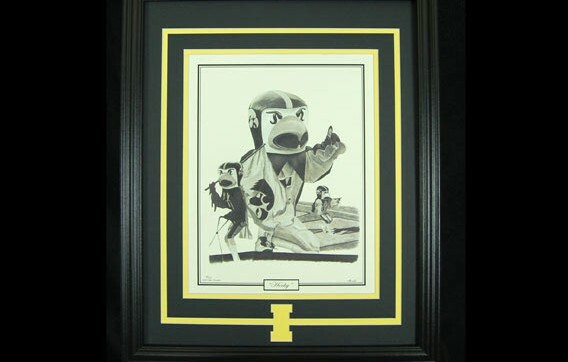 Once completed, I was happy I stuck it out and learned a little Hawkeye history in the process. The older gentleman portrayed in the background is Team Dr. Shorty Paul, who was also the inventor of Bufferin and Rolaids. The the matting is made using the "Old Gold", reminiscent of the Forest Evashevski era. I have an extremely long list of former Hawkeye greats in the back of my mind that I know I need to portray in my drawings. Sometimes it’s difficult to plan which one to attempt next. 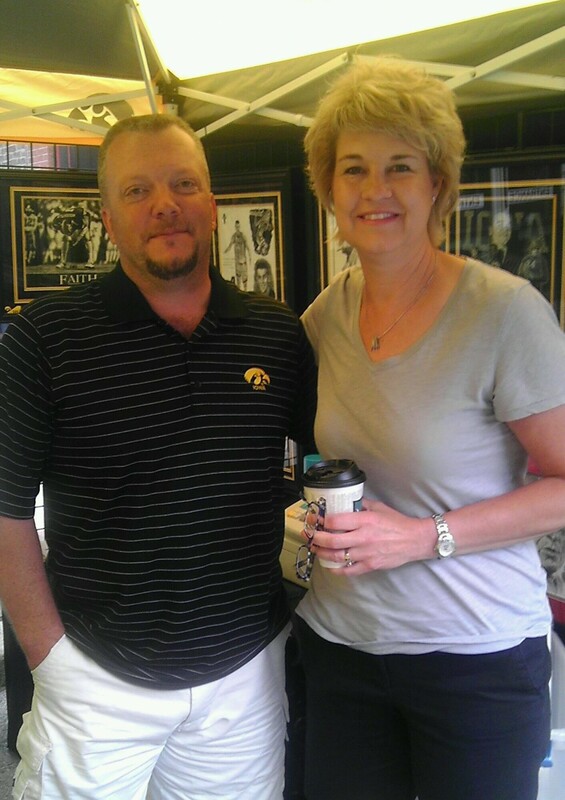 Brad Banks made the decision easy when he unexpectedly popped into my booth at an art show one day and I was a little embarrassed that I had no “Brad Banks” hanging on the wall. 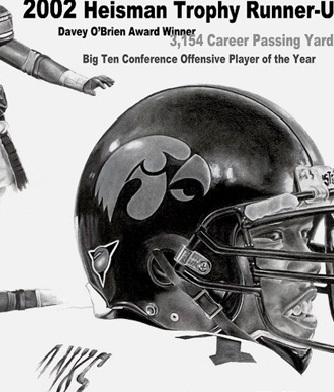 Some of my favorite Hawkeye memories were when Brad was at the helm of the team, racking up numerous yards and achievements including runner-up for college footballs greatest prize, the Heisman Trophy. 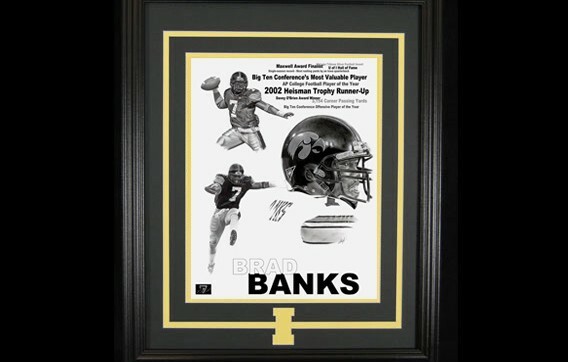 In these three images I tried to portray Banks’ passing attack, running skills, and his enjoyment & love for the game. 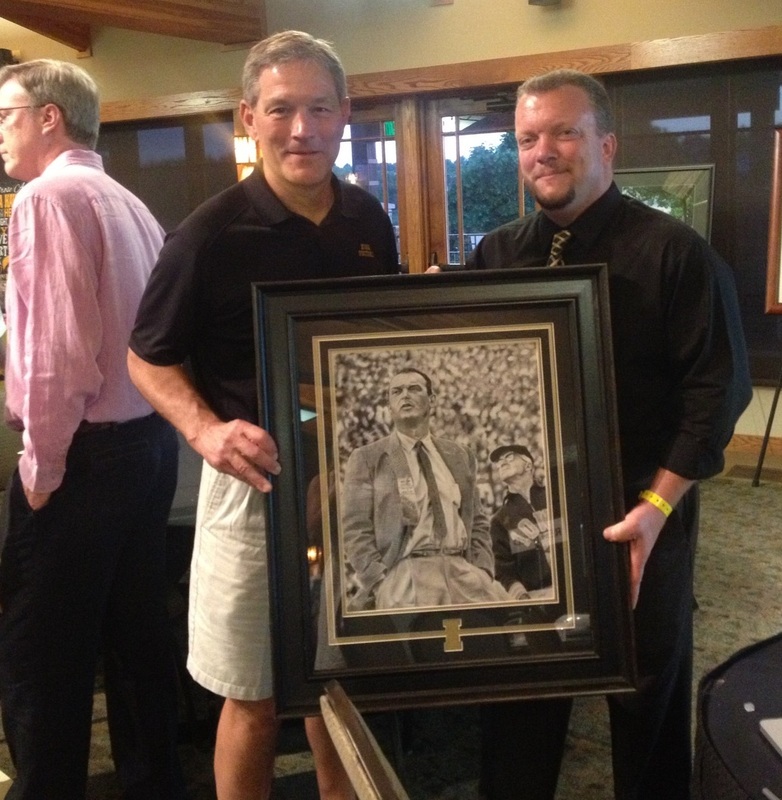 This past spring I had the honor of being invited to an “Ed Thomas Family Foundation” fundraising event where I got to meet some of the Thomas family and gain an understanding of the great things that ETFF does. 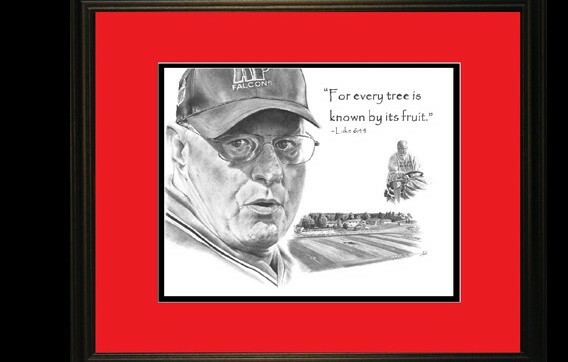 It had always been in the back of my mind to try to do something to honor the legacy of Coach Thomas, but after that night and subsequently reading the book “The Sacred Acre”, I knew I wanted to do something. Somewhere in the beginning of the book I read, “For every tree is known by its fruit”. That really struck me. 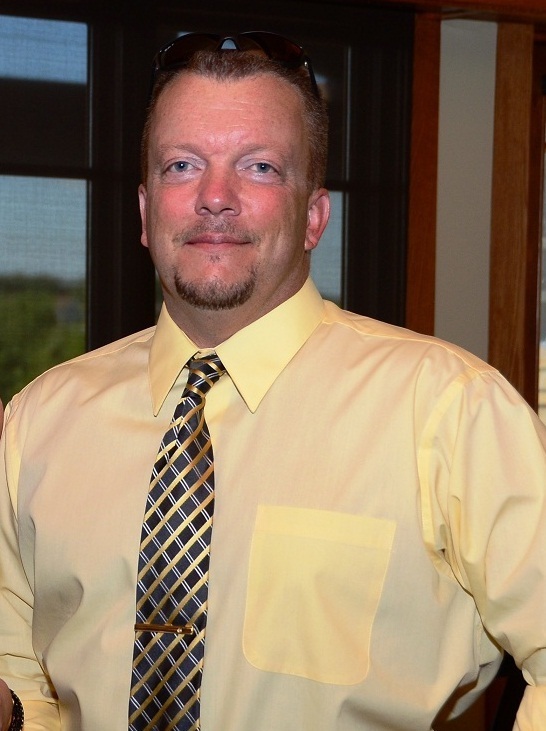 It could be taken on so many levels when referring to Coach “T” and the Parkersburg community. This is by far the largest illustration I had attempted and took well over 100 hours to complete. 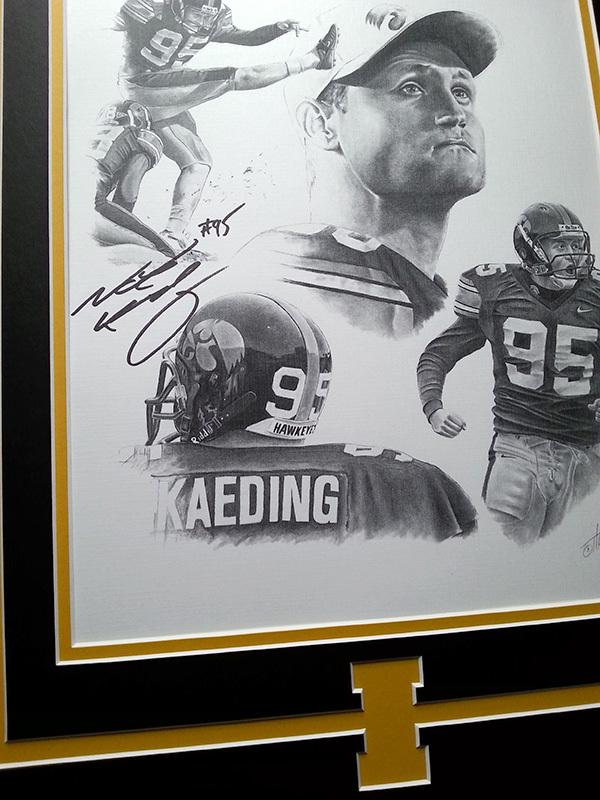 A percentage of each sale will also go to the “ETFF” which I am very proud to help support. 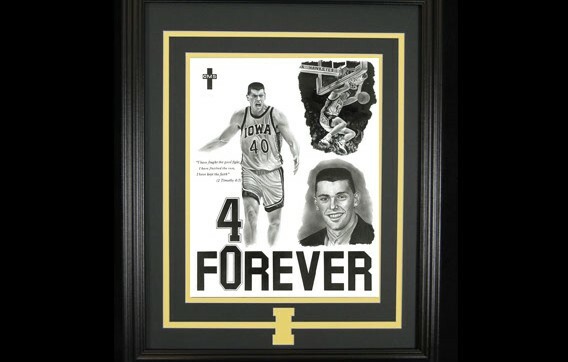 Well, I wanted to do this tribute to Norm for obvious reasons. Norm's passing was felt wide in the Hawkeye and college football community and I knew I wanted to create something simple to honor his life. There were so many "Normisms" that I could have used but the one I depicted happened to be my favorite & I didn't want the piece to be too "busy". I had the pleasure of meeting Norm on a couple of occasions & he always made me smile. 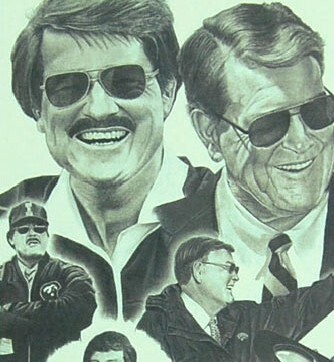 He had such great stories & I loved his no-nonsense approach to coaching. 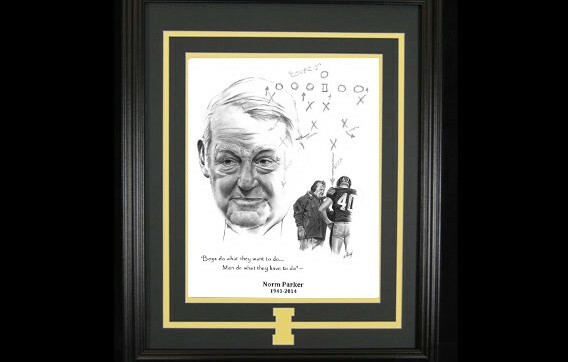 RIP Coach Norm Parker. 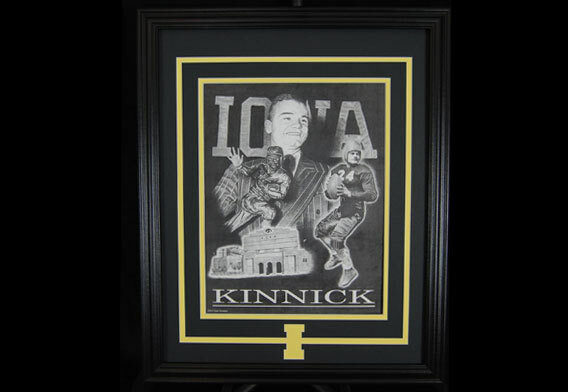 Admittedly, I hadn’t been to an Iowa Wrestling Meet in years until the Dec 21, 2013 Penn St. match. Someone said “If you think Carver gets loud during a Basketball game, just wait”. 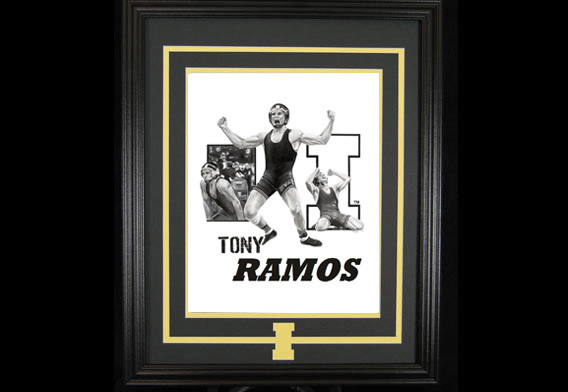 I had my doubts, but when Tony Ramos pinned his opponent that night, the entire crowd erupted and flew from their seats in front of me, yelling and spinning in circles with their fists pumping in the air. It confirmed the suspicions I already had…..wrestling fans are nuts. I also knew that wrestling fans simply don’t have the memorabilia & merchandise available to them as football & basketball fans do. 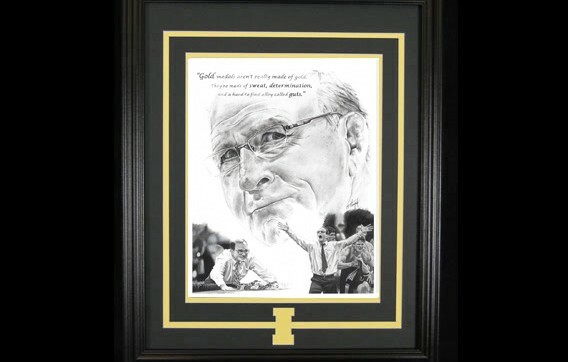 My “Dan Gable” piece has become my top seller over all others. 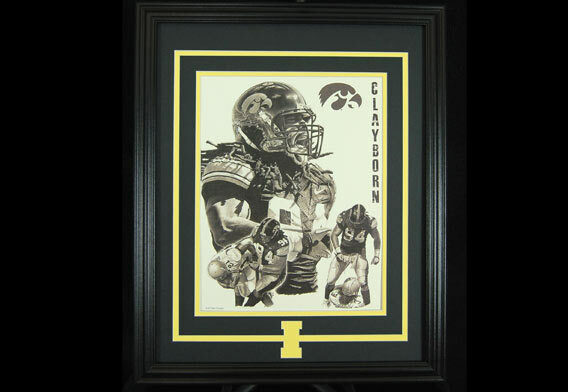 I continued to follow Tony’s senior season right up to his National Championship. 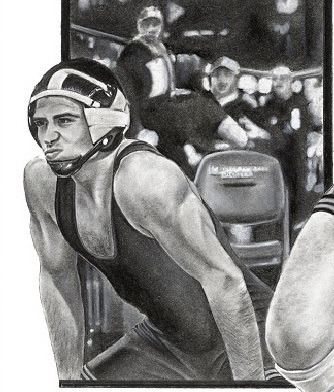 If I remember correctly, he took the National Title on a Saturday night, and I started drawing this piece the following Monday. 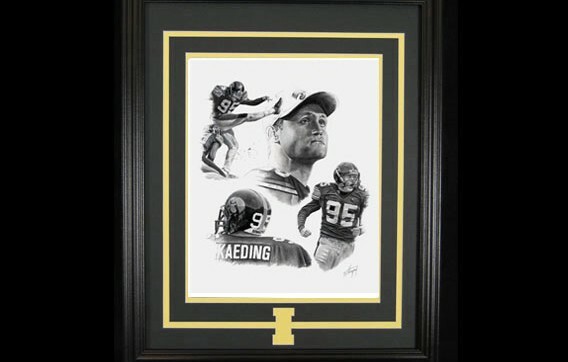 A limited edition, autographed, framed, and matted "Kaeding" print. 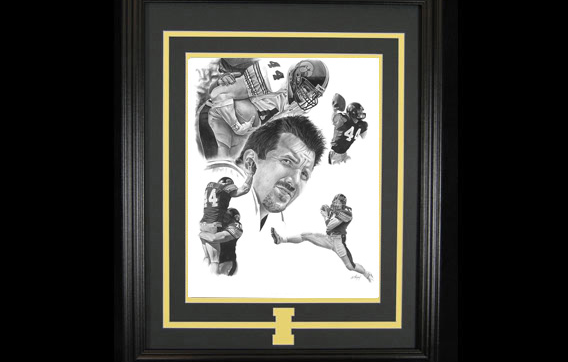 1 of 44 “Dallas Clark” autographed 11×14 prints, fully framed & matted with the “Iowa” matting. 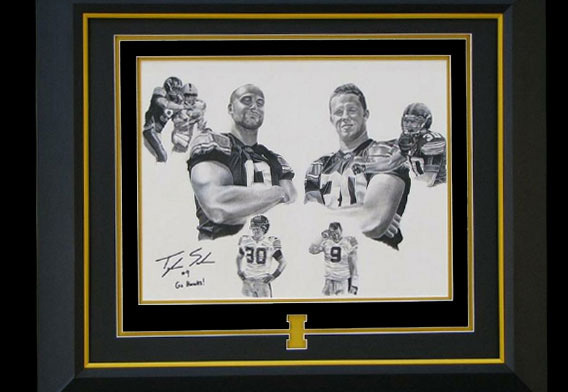 These are limited to only 44 pieces with #1 and #44 being held in reserve for fundraising purposes. 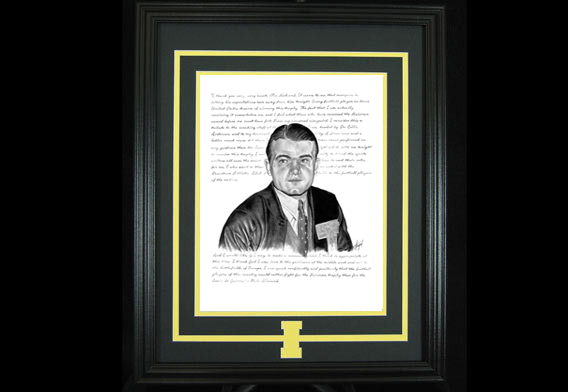 Includes stock photo of Dallas signing print. 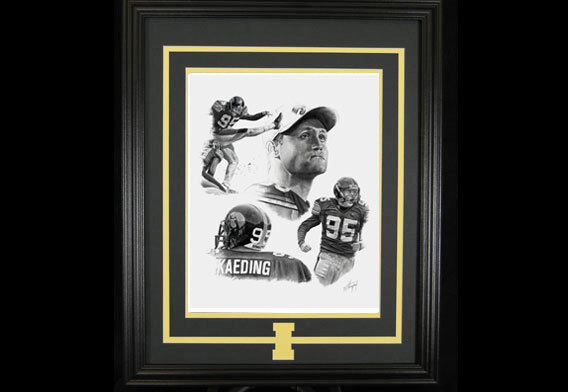 Portion of the proceeds goes directly to the Dallas Clark Foundation. A new piece, just in time for the 2015 season, "Pat Angerer"
With the popularity of my "Gable" piece, I wanted to do another that captured "Dan Gable - The Coach". 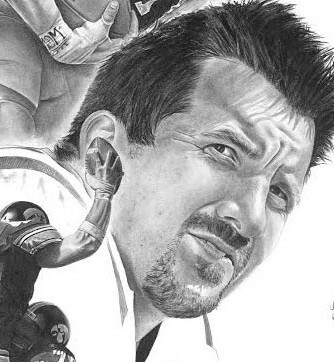 The man has just done too much in his life to capture in only one drawing.